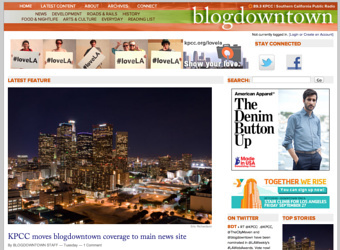 On Tuesday afternoon KPCC shut down blogdowntown, the community news site that I started in 2005. It's not much of a surprise: the site has been drifting downward since February of 2011, when I had to stop printing the weekly paper that we had launched six months earlier. It was an amazing ride while it lasted, though. What started as just me writing about my exploration of a neighborhood turned into a news source that at its peak was attracting 40,000 to 50,000 unique monthly visitors. That traffic was down more than half by the time KPCC pulled the plug.